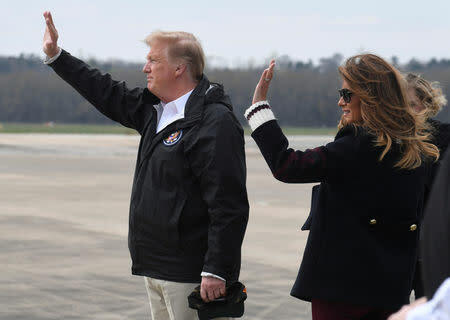 "This is unbelievable," Trump said as he and Alabama Governor Kay Ivey surveyed the devastation. He said he had seen "unbelievable" destruction from the air, too. Relatives of one victim, Marshall Lynn Grimes, showed the president the 59-year-old's cherished motorcycle vest and Bible. Trump hugged members of the family. Tables at the church were piled high with donated clothes, toiletries and other items. Twenty-three crosses, one for each of those killed, were set up on a lawn outside. Trump met privately with more victims' families inside the church. He said he talked with one woman who lost 10 people in the storm. "I said how did it go, and she said I lost 10," Trump said. "I've never seen anything like it." He told dozens of community volunteers gathered in the church auditorium that the first responders were doing an "A-plus job." "We're gonna take care," Trump said. "We couldn't get here fast enough ... I wanted to come the day it happened." Sunday's tornadoes were the deadliest to hit the state since 2013. All 23 victims, including four children and seven members of one family, were killed in or around Beauregard, in rural Lee County about 10 miles (16 km) southeast of Auburn. Mobile homes were tossed over and ripped open last weekend, their contents strewn across a landscape littered with debris and uprooted trees. In some places, shreds of houses had hung from the limbs of the few trees left standing. The worst of the twisters, stirred up by a late-winter "supercell" thunderstorm, were ranked by forecasters at step four of the six-step Enhanced Fujita scale of tornado strength.